With all the kiddoes going back to school, today's challenge at Cooking with Cricut is School Days. After finding a two tumbler pack at TJMaxx for super cheap this past weekend, I was so excited to try out vinyl for the first time. For the little gift tag, I used My Pink Stamper's School Days stamp set. That is a very clever project and a GREAT gift! Thanks for sharing! Love these clear cups. Fun gift. Love your tumbler!! 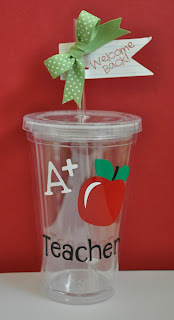 It's perfect for a teacher! This turned out adorable, and I like how you stuck the little tag on the side of the straw, so cute!!! Great job on the tumbler! Nice job on the tumbler especially for your first attempt! non-school related tumbler idea..."love to scrap" or something beachy. How cute!! Such a creative idea!